Jeff Sanders was born in San Francisco. He earned a bachelor’s degree in Industrial Design and a master’s in Sculpture from California State University at San Jose. After briefly working as a college art instructor in the early 1970s, Sanders became a full-time artist, art-fabricator and art project manager. He has worked at the well-known Gemini G.E.L Studios in Los Angeles where he collaborated with such luminaries as Ed Kienholz, Claes Oldenburg, Roy Lichtenstein and Robert Rauschenberg. In addition, Sanders has collaborated on projects with well-known artists with ties to Ventura County such as Sally Weber, Jud Fine, and John Nava. Bronze or steel are the preferred media for most of the artist’s outdoor sculptures, which are held in both private and public collections. His subjects involve the everyday images of America. From small to monumental, Sanders’ pieces are executed with sensitivity, precision and frequent expressions of tongue in cheek humor. 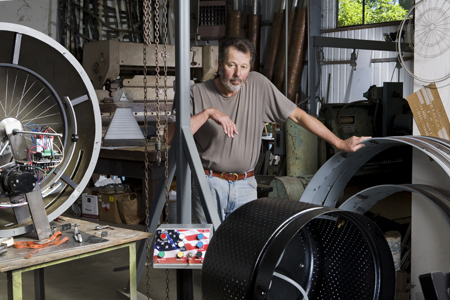 He works adeptly with aluminum, poly resins, patinas, and numerous other components in the custom studio he built. His zest for life is reflected in his art. Sanders and his wife, artist Audrey Sanders, reside in Ojai. Jeff Sanders’ documentation took place in 2005 and was sponsored by Dr. Anthony T., Barbara Hirsch and Dr. Richard Gould. The FOTM Archive contains extensive information about this artist.